At our workshops we can carry out the installation and setup of upgrades to all aspects of the engine, suspension, braking system and transmission. With numerous options for normally aspirated and forced induction setups we have a wealth of knowledge and experience with the Rover K-Series and Toyota engines (2ZZ, 1ZZ, 1ZR, 2GR) that have featured in the various models of Elise, Exige, and Evora over the years. Our main aim when performance tuning your Lotus is to deliver a tuned car that delivers both the benefits of more power and agility while maintaining the great balance and character that all go towards enhancing the overall driving experience. “Dynamics” is a word you will often find us using when we discuss your upgrade requirements. Here, our approach is to refine and enhance the performance of the car using carefully selected components and implementing them correctly. If you are considering using our services, we can provide friendly advice to help you make the right decisions on any intended upgrade plans you may have for your car. Why not make an appointment and come and see what we can do for your Lotus? Hangar 111 can set up your Elise or Exige, taking care to ensure you get the very best results with whatever enhancements you choose for your vehicle. For precise and dependable engine tuning we use proven rolling road dynamometers. To ensure your Lotus handles as it should, we use proven 4-wheel alignment technology to get your suspension geometry just right. Our range of performance parts and accessories includes everything necessary to get the best performance from your engine, chassis and transmission. More details can be found by exploring the Lotus Tuning menu above or visiting our Online Store. 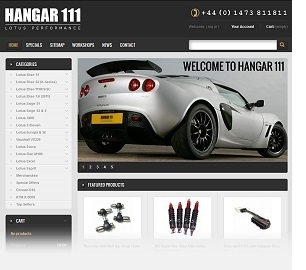 With Hangar 111 you don’t just have access to a wide-range of performance parts in our online store, we can advise, install and set them up to your specific requirements here in our workshops. There are so many products and services available that we simply can’t list them all – it would take forever! If you have some specific requirements and can’t find what you are looking for on our website or online store then please drop us a line and we will be happy to help. For more information about what we can do to enhance your Lotus please call or email us, where we will be happy to discuss your requirements.